MEGASCAVENGER is the spawn of inexhaustible Swedish maniac Rogga Johansson, known for his endless work in acts including PAGANIZER, RIBSPREADER, DEMIURG, THE GROTESQUERY, BONE GNAWER, REVOLTING and more. The latest resume to his ever-expanding arsenal, MEGASCAVENGER is where Johansson spews out his death metal dreams by recruiting the talents of some legendary death metal figureheads. 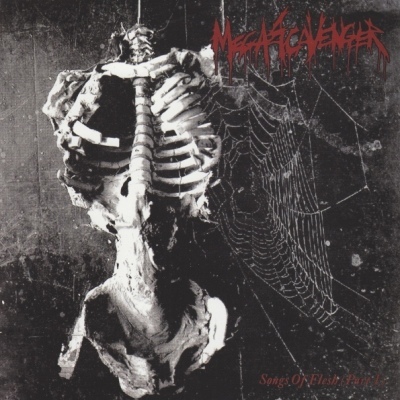 Dark Swedish death metal is what MEGASCAVENGER is all about. The debut release from this interesting project shall arrive in the form of a two-song 7" EP entitled "Songs Of Flesh (Part I)", which features growling duets with none other than Jörgen Sandström (ex-GRAVE, KRUX, TORTURE DIVISION) and Paul Speckmann (MASTER, DEATH STRIKE, ABOMINATION). Rogga is working hard on the first MEGASCAVENGER full-length to be released this Summer, also via Selfmadegod. The list of henchmen involved with the LP is even longer, already including Marc Grewe (Morgoth, Insidious Disease), Dan Swanö (ex-Bloodbath, Edge of Sanity), Eric Daniels (ex-Asphyx), Jonas Lindblood (Puteraeon), Patrick Mameli (Pestilence) and more to be confirmed. Stay tuned for more news in the weeks ahead.